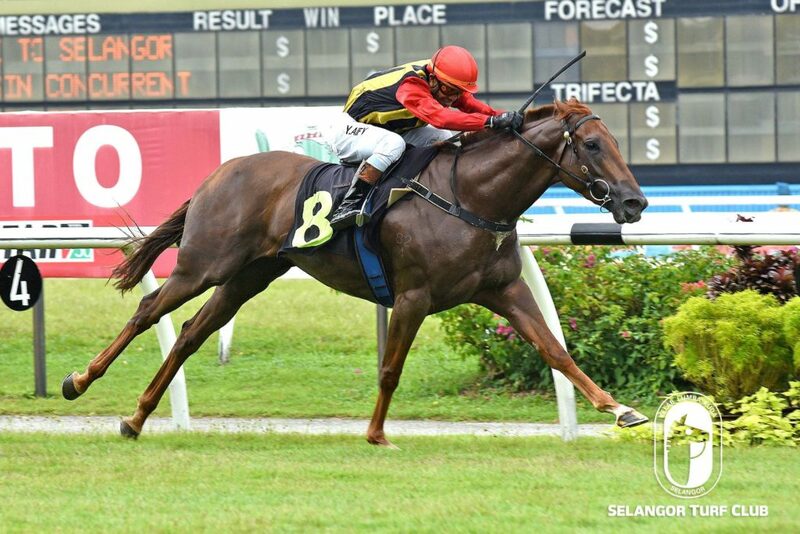 Trainer Frank Maynard’s Symphony Eclipse did a dashing workout at Selangor Turf Club today (Tuesday). Taken out by a track rider, the four-year-old mare by Red Giant, trotted two rounds on the inner sand track and then strode out fluently over 600m in 37.6 seconds on a tight rein. Symphony Eclipse with Jockey Y Aify on board broke the ice in fine fashion beating Alrina in the Open Maiden event over 1200m at this course last month. Still in mint condition, Symphony Eclipse looks hard to beat in the Class 4 (B) – 1300m on Sunday. Metro A – 1400m (Card 1): Emergency Acceptor, Royal Explorer, cantered then sprinted keenly in 38.8 seconds. Class 4 A – 1300m (Card 3): Bukit Subang did an eye catching workout in 37.6 seconds. Stayers Stakes B – 1800m (Card 6): Mr Paulandre trotted and then galloped strongly over 600m in 37.7 seconds. Open Maiden – 1300m (Card 11): Jabbar trotted two rounds and sprinted smartly over 600m in 36.6 seconds. Open Maiden – 1300m (Card 12): Mr Washington trotted two rounds and then did a sparkling workout in 36.6 seconds. The going was yielding: slow work on the sand track and fast work on the No.2 grass track.